Education Costs > How Much Does Aqua-Tots Swim Lessons Cost? How Much Does Aqua-Tots Swim Lessons Cost? The Aqua-Tots program focuses on teaching children to be happy and at ease in and around a water environment and helping them implement a skill that may save their life one day. In a warm, friendly, and clean aquatic environment, Aqua-Tots utilizes a unique teaching technique that enhances both the child’s results and enjoyment. Their lessons are reasonably priced while still maintaining high-quality programs as well as small class sizes. 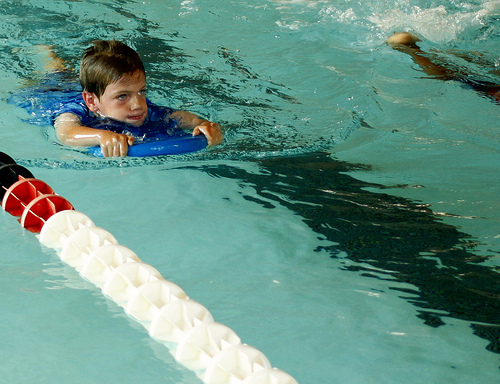 The schools offer year-round swim classes for infants, babies, toddlers, kids, adults, swim teams, and children with special needs. How much do Aqua-Tots swim lessons cost? On average, a once a week group swim lesson at Aqua-Tots, according to those who have attended, are priced about $70 to $85 per child per month, while two lessons per week will cost about $130 to $150 per month. Three group lessons per week cost around $200 to $225 for the month. The costs, in the end, will depend on your local location and the number of lessons you want to attend per week. Use these numbers as an estimate as they will vary. Most of the time, you can use their official search function and you should be able to find the pricing on your local locations page. A member on this DFWAreaMoms.com forum thread claimed that she paid a $35 annual fee and $79 per month for lessons. This was for one lesson a week with four total children. The Aqua-Tots tuition in Troy, Michigan, according to their official website pricing sheet, charges $80 per month for one lesson per week and $223 per month for three lessons per week. Another location in Mesa, Arizona also lists their official prices, with a one lesson per week class priced at $82 per month and three lessons per week at $200 per month. There is an annual registration fee of $20~ per child or $30~ per family. If you feel that your child needs individual attention or would learn better in a one-on-one session, then individual lessons are available for an additional fee. The same can be said for semi-private lessons, which offers a smaller-than-average class size. If your child enjoys the water and wants to join a swim team, then Aqua-Tots offers swim teams your child can join. These teams will learn the art of all four accepted swim strokes as well as racing techniques. There are different levels of their competitive training, even through high school and college level. This school follows a model of only up to four kids per class. This warm setting presents a great setting for children learning to swim. Private, semi-private and smaller group lessons are available as well. The average lesson is 30 minutes per class. Since the school is opened year-round, families can apply at any time. Be sure to check out Groupon as the school does advertise on here occasionally. For example, in the past, they did offer a $34 monthly special. Discounts are offered for the second child and beyond. The center often offers promotions for those looking to join. Refer to their official website to see if any discounts are available. Aqua-Tots is probably one of the many swimming school options in your area. Be sure to compare prices with local instructors, the local Parks and Recreation or even other franchise-based schools.